Brick Loot is a box subscription company for LEGO and Brick fanatics! Not sure what to buy for the kids that has everything? Give the Gift of Brick Building with Brick Loot Subscription Box. One of our favorite aspects of the Brick Loot subscription is that all of the products are unique to the box and cannot be purchased in stores. Our kids received Brick Loot as a Christmas Gift and they are asking for the gift to be extended. Do you remember getting mail as a kid? My kids never receive mail, so the treat of getting a gift box each month really means a lot to them. We received this month’s box right before the big blizzard, so it was perfect timing for the kids to build blocks before going out to build a snowman. 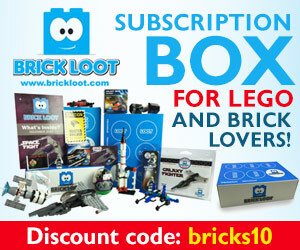 Brick Loot subscribers will receive a monthly box filled with unique, custom and never-before-seen items that work with LEGO bricks and custom building. Each month the Brick Loot box is filled with 4-8 items that were hand picked by Brick specialists who scour the world for the newest and coolest products for you to collect. These are all very popular with the kids. My kids love the variety of each box and how much fun they have building the unique sets. How does Brick Loot work? They research the latest & greatest Brick themed toys, ship a custom filled box to your doorstep, and you will receive an amazing box monthly full of awesomeness! Skip the candy this Easter and give the gift of Brick Building. Head over to Brick Loot to see which subscription is right for your favorite brick builder. subscriptions start at $27.00 Month + Shipping but can be purchased monthly, Recurring 3 or 6 month plan.